Digital Signage is an effective method of marketing and people are adopting it rapidly because of its reasonable cost with positive outcomes in business. Digital Signage marketing is possible with flat screen TV devices like LCD, LED and plasma. Due to its flatter design Plasma and LCD can also be used in the print media like bill boards and posters. If we talk about with the perspective of digital advertising devices LCD, LED and plasma can use in play moving images which are more eye catching and engage more people rather than any other marketing mythology. Digital Signage also flexible in that content can be changed by remote and screens can be networked which allowing scheduled content to be played throughout different times according to needs of different promotions or audience. The Place has very significant role in Digital Signage. We can place Digital Signage anywhere that traditional print media has been placed. People prefer outdoor locations for the Digital Signage because at an outdoor location more people get attached with Digital Signage as compare to Digital Signage inside a retail unit. The only negative aspect of the outdoor Digital Signage is its protection but now companies introduce waterproof and special LCD and LED for Digital Signage purpose which reduces the level of risk. 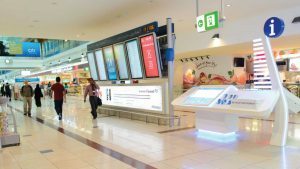 For choosing the location for the digital advertising and Digital Signage there is one rule of thumb that are implemented around the world and that is LCD or LED should be placed in the most visible location possible. Eye-level is best and in areas of high footfall which makes digital outdoor signage. TV screenLCD, LED or plasma of any standard can be used for Digital Signage Content while the size of LCD, LED or plasma depend on the place where you want to display your Digital Signage. Content is considered as a most important aspect of any sort of digital advertising camping. If creating content is difficult for you then you can also approach software’s which help you in creating best content for you like Concerto, Vodigi, Xibo, Open Splash, Screenly, Rise Vision, Cignage and much more.